 本申请要求于2005年3月4日提交的、题为“SYSTEM AND METH0DF0R PROVIDING LOCATION BASED SERVICES OVER A NETWORK(用于经过网络提供基于位置的服务的系统和方法)，，的美国非临时专利申请序列号11/089，455的优先权，该申请是于2004年7月3 日提交的、题为“AidedLocation Communication System(辅助的位置通信系统)”的美国专利申请序列号10/885，507的部分连续。美国专利申请序列号10/885，507是于2003年5 月22 日提交的、题为"Search Domain Reducing Frequency Transfer in aMulti-mode Global Positioning System Used With Wireless Networks (无线网络使用的多模全球定位系统中的搜索域减少频率转移），，的PCT申请序列号PCT/US03/16308的部分连续，该申请是于2002 年5 月22 日提交的、题为“Search Domain Reducing Frequency Transfer in a Multi-mode GlobalPositioning System Used With Wireless Networks (无线网络使用的多模全球定位系统中的搜  This application claims the March 4, 2005, filed, entitled "BASED SERVICES OVER A NETWORK SYSTEM AND METH0DF0R PROVIDING LOCATION (through the network for systems and methods for providing location-based services) ,, US Non-Provisional Patent application serial No. 11 / 089,455, which application is on July 3, 2004 filed US patent entitled "AidedLocation communication system (assisted location communication system)," application serial No. 10/885, section 507 of the continuous US Patent application serial No. 10 / 885,507 is 2003 May 22 submitted entitled "Search Domain Reducing Frequency Transfer in aMulti-mode Global Positioning System used With wireless networks (Wi-Fi use part of the multi-mode global positioning system in the search field to reduce the frequency shift) ,, the PCT application serial No. PCT / US03 / 16308 continuous, the application is May 22, 2002, filed, entitled "Search domain reducing frequency transfer in (multi-mode wireless networks using GPS search in a multi-mode GlobalPositioning system used With wireless networks 索域减少频率转移）”的美国专利申请序列号10/155,614的部分连续，现在美国专利号6，684，158 (其是于2001年2月28日提交的、 题为“Information Transfer in a Multi-mode Global Positioning System Used withffireless Networks (无线网络使用的多模全球定位系统中的信息转移），，的美国专利申请序列号09/795，871的部分连续)、现在美国专利号6，427，120(其在部分119(e)下要求于2000年8月14日提交的美国临时申请序列号60/225，076的优先权），全部通过引用并入本申请。 Cable reduce the frequency domain transfer) "part of US Patent Application Serial No. 10 / 155,614 is continuous, now US Patent No. 6,684,158 (which is on February 28, 2001, filed, entitled" Information Transfer in a Multi -mode global positioning system used withffireless networks (information transfer multimode global positioning system used in wireless networks) ,, U.S. Patent application serial No. 09 / 795,871 continuously), now U.S. Patent No. 6,427,120 (which claims priority to US 2000, filed August 14, in the lower portion 119 (e) provisional application serial No. 60 / 225,076), and all incorporated herein by reference. 美国专利申请序列号10/885，507还是于2003年3月10日提交的、题为"Information Transfer in a Multi-mode GPS Used with Wireless Networks (无线网络使用的多模GPS中的信息转移），，的美国专利申请序列号10/385，198的部分连续，该申请是于2002 年4 月19 日提交的、题为Information Transfer ina Multi-mode GPS Used with Wireless Networks (无线网络使用的多模GPS中的信息转移），，的美国专利申请序列号10/127，229的连续，现在美国专利号6，542, 823(其是于2001年2月观日提交的、 题为“ Information Transfer in aMulti-mode Global Positioning System Used with Wireless Networks (无线网络使用的多模全球定位系统中的信息转移)”的美国专利申请序列号09/795，871的连续)、现在美国专利号6，427，120 (其在部分119 (e)下要求于2000 年8月14日提交的美国临时申请序列号60/225，076的优先权），全部通过引用并入本申请。  US Patent Application Serial No. 10 / 885,507 was in March 10, 2003, filed, entitled "Information (multi-mode wireless networks use GPS in with Wireless Networks Information Transfer in a Multi-mode GPS Used transfer) ,, US Patent application serial No. 10 / 385,198 is continuous, the application is April 19, 2002, filed, entitled Information transfer ina Multi-mode GPS used with wireless networks (Wi-Fi use information transfer in multi-mode GPS) ,, US Patent application serial number 10 continuous / 127,229 now US Patent No. 6,542, 823 (which is a concept in February 2001, filed, entitled "information transfer in aMulti-mode global positioning system used with wireless networks (information transfer multimode GPS wireless networks used by) "US Patent application serial No. 09 continuous / 795,871), and now US Patent No. 6,427 , 120 (which claims priority to 60 / 225,076 U.S. provisional application serial No. 2000, filed Aug. 14 in the lower portion 119 (e)), all incorporated herein by reference. 美国专利申请序列号10/885，507还是于2002年7月12日提交的、题为"Multi-mode GPS For Use with Wireless Networks (用于无线网络使用的多模GPS) ” 的美国专利申请序列号10/194,627的部分连续，该申请是于2002年7月12日提交的、题为“Multi-mode Global Positioning System For Use withWireless Networks (用于无线网络使用的多模全球定位系统）”的美国专利申请序列号10/068，751的连续，现在美国专利号6，519，466(其是于2001 年2 月8 日提交的、题为“Multi-mode Global Positioning System For Use with WirelessNetworks (用于无线网络使用的多模全球定位系统）”的美国专利申请序列号09/781，068的连续)、现在美国专利号6，389，291 (其在部分119 (e)下要求于2000年8月14日提交的美国临时申请序列号60/225，076的优先权），全部通过引用并入本申请。  US Patent Application Serial No. 10 / 885,507 was in 2002, filed July 12, entitled "Multi-mode GPS For Use with Wireless Networks (for multi-mode wireless network using GPS)," the United States Patent application serial No. 10 / 194,627 is continuous, the application is July 12, 2002, filed, entitled "multi-mode global positioning system for use withWireless networks (global positioning system for multimode wireless network used) "US Patent application serial No. 10 / 068,751 is continuous, now US Patent No. 6,519,466 (which is 2001 filed on February 8, entitled" Multi-mode Global Positioning System for Use with WirelessNetworks (multimode global positioning system used for a wireless network), "U.S. Patent application serial No. continuous), now U.S. Patent No. 6,389,291 (which is a portion 119 (e) claims 200,009 / 781,068 in on August 14 US provisional application serial No. 60 / 225,076), and all incorporated herein by reference. 本发明一般涉及提供基于位置的服务，包括如蜂窝手机的移动站（MQ的位置信息。更具体地，本发明涉及经过网络（更具体地如因特网和web服务的利用TCP/IP协议的网络）分发基于位置的服务。  The present invention generally relates to providing location-based services, including as a cellular handset mobile station (MQ location information. More particularly, the present invention relates to through the network (more specifically, such as the Internet and the web service using TCP / IP protocol network) to distribute location-based services. 基于位置的服务（LBQ或依赖位置的服务一般指提供依赖于特定位置（例如移动站的当前位置）的无线服务的概念。移动站典型地为蜂窝手机，但还可以是个人数字助理(PDA)或一些其它类型的移动设备、移动站或能够与网络接口的用户终端。提供LBS的系统使移动站或一些其他网络组件或实体（例如应用服务器）的用户能够对移动站的位置、 或额外地对依赖于移动站的位置的服务或应用做出请求。该请求可以是由移动站的用户启动的单次请求。例如，移动站可以请求示出其当前位置、从其当前位置到期望目的地的驾驶方向、关于离其当前位置最近的特定类型的商业（例如，餐馆、医院、加油站等）的存在和/ 或位置的信息等的地图。该请求还可以在预定的时间间隔或响应于事件的发生而激发。例如，应用服务器出于追踪或紧急目的或为了提供基于 Concepts  Location-based services (LBQ or location dependent service generally refers to the provision dependent on the particular position (e.g., the current location of the mobile station) of a wireless service. The mobile station is typically a cellular phone, but may be a personal digital assistant (PDA), or some other type of mobile device, mobile station or can be a user terminal and the network interface provided LBS system mobile station or some other network component or entity (e.g., an application server) of a user to position a mobile station, or additionally making a request for a service or application dependent on the location of the mobile station. the request may be a single user-initiated request for the mobile station. for example, the mobile station may request its current position is shown, from its current position to desired destination, driving directions, maps and other information exists from its current location nearest a particular type of business (for example, restaurants, hospitals, gas stations, etc.) and / or location of the the request may also be a predetermined interval of time or in response to the occurrence of an event excited. 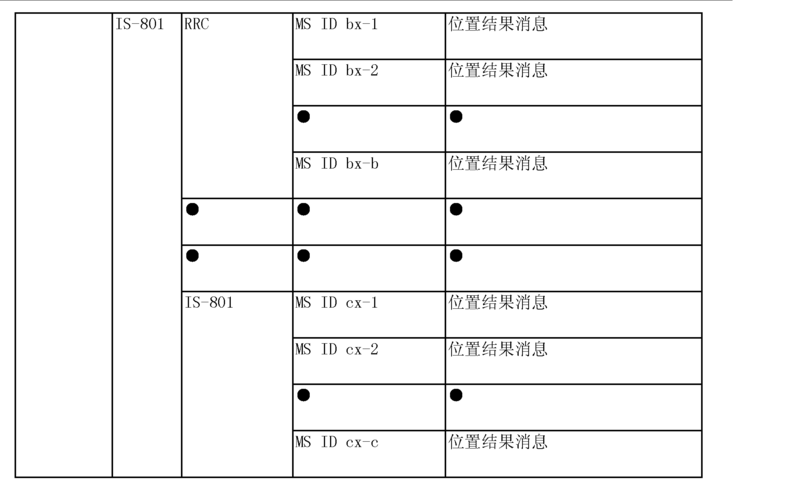 for example, an application server for tracking or emergency purposes or to provide a basis 置的信息（如与最近的商业相关的广告或优惠券），可以响应于穿过一个地理区域到另一个区域的移动站，请求该移动站的位置。因此，一旦移动站的位置被确定，就可以将基于位置的信息提供给请求方。该信息可以从数据库（其可以由内容提供者拥有并且使得对订户可访问）可访问，并且根据特定应用以特定格式提供（例如，地图，行进指令，商业相关的内容），并且根据请求方的位置以及根据为用户或由用户设置的个人喜好和/或根据其他预定规则过滤。一般地，移动站的位置从无线网络和/或合适的定位设备（如卫星定位系统，并且更具体地全球定位系统（GPS)) 获得。 Information set (e.g., the recent commercial advertising or coupon), in response to a geographical area to pass through another region of the mobile station, requesting the location of the mobile station. Thus, once the location of the mobile station is determined, may be location-based information provided to the requesting party. this information may be from a database (which may be provided by the content owned and such that the subscriber can access) access and provide (e.g., map, travel instruction in a specific format depending on the particular application , business-related content), and the position of the requesting party and according to and / or filtered according to other predetermined rules for a user or personal preferences set by the user. in general, the location of the mobile station from a wireless network and / or a suitable positioning device (e.g., a satellite positioning system, and more particularly to a global positioning system (the GPS)) is obtained. GPS (在美国称作GPS NAVSTAR)定位技术为本领域技术人员所熟知，并因此不必在此详细描述。  GPS (referred to in U.S. GPS NAVSTAR) positioning techniques known to those skilled in the art, and therefore need not be described in detail. 简单来说，GPS是基于位于环绕行星的M个卫星和5个监视站的现有格局， 使得卫星能够广播扩频信号。 Briefly, GPS is based on the existing structure located around the planet and 5 M satellites monitoring station, so that broadcasting satellites can spread spectrum signal. 这些GPS信号可以用作确定移动站的位置的参考。 The GPS signals can be used to determine a reference location of the mobile station. 除了GPS， 可以利用的另一定位技术是俄国系统GL0NASS (全球导航卫星系统），或当前称为伽利略系统的未来的欧洲系统，其以类似方式运行。 In addition to GPS, the other positioning technology can take advantage of the Russian system GL0NASS (Global Navigation Satellite System), or the current system called the future European Galileo system, which is run in a similar manner. 在GPS中，各卫星具有12小时的轨道，并且位于六个轨道平面中，每个平面中有四个卫星，同样地以60度分隔开，并且在相对于赤道平面的55度倾斜。 In GPS, each satellite having a 12-hour orbit, and are located in six orbital planes, each plane has four satellites, in the same manner spaced apart at 60 degrees, and 55 degrees inclined with respect to the equatorial plane. 各卫星在两个频率(L波段，Ll (1.575. 42 MHz)和L2 (1.227. 60 MHz))中传输载波信号。 Each satellite transmission carrier signal at two frequencies (L-band, Ll (1.575. 42 MHz) and L2 (1.227. 60 MHz)). 位置通过运行可内建在蜂窝电话或其他移动设备中的GPS接收器确定，以获取用于精确定位GPS接收器的位置的足够数量的卫星。 By running position may be built in a cellular phone or other mobile device to determine the GPS receiver to acquire a sufficient number of satellites to pinpoint the position of the GPS receiver. 典型地，必须获取最少三个卫星，以便可以三点定位它们相对于GPS接收器的位置。 Typically, a minimum of three satellites must be acquired to be able to locate them with respect to the three position of the GPS receiver. 然而，优选地为四个卫星，以便获得高度信息并确保GPS接收器中的时钟与各卫星中更精确的原子时钟同步。 Preferably, however, four satellites in order to obtain information about the height and ensure that the GPS receiver and each satellite clock more accurate atomic clock synchronization. 一般地，利用空间中的各卫星已知的位置（即，轨道和时间已知）、和卫星与GPS接收器的已知距离（即，从各卫星到GPS接收器的无线信号的行进时间可以确定，因为它们的无线信号传播的速度是已知的）、并且校正或补偿任何延迟和差错（如天体位置差错）计算GPS接收器的位置。 Generally, each satellite in space using the known position (i.e., track time and known) a known distance, and the satellite and the GPS receiver (i.e., traveling time from each satellite to the GPS receiver may be a wireless signal determining, as a radio signal propagation speed at which they are known), and correct or compensate any delays and errors (such as celestial position error) is calculated position of the GPS receiver. 为了能够测量从卫星到GPS接收器的距离，卫星以精确的间隔传输伪随机码（PRC)。 To be able to measure from the satellite to the GPS receiver from the satellite transmission interval precise pseudo-random code (PRC). PRC是携带定时信号的比特流。 PRC is a bit stream carrying the timing signal. PRC还包括卫星的地址，因此每个卫星具有唯一的PRC，使得GPS接收器能够区分不同卫星信号。 PRC further includes an address of a satellite, each satellite has a unique PRC, so that the GPS receiver can distinguish between the different satellite signals. 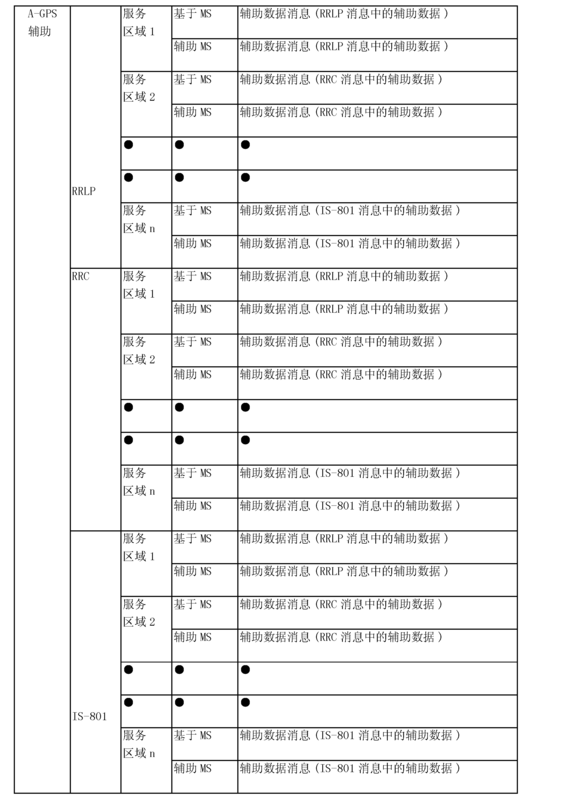 Ll载波频率上携带的PRC，（称作粗捕获（C/A)码）被指派用于民用。 Carried on the Ll carrier frequency PRC, (referred to as a coarse acquisition (C / A) code) is assigned for civilian use. 因为GPS接收器最初不知道其位置，所以它必须搜索卫星信号，以便进行确定其位置所需的测量。  Since the GPS receiver does not initially know the location, it must search for the satellite signal, for determining required measurement position. 从冷启动，搜索可能需要大约十二分钟，其被认为对于移动站的用户而言太长。 From a cold start, the search may take about twelve minutes, it was considered for the user of the mobile station is too long. 获取卫星数据的时间可通过提供除天体位置、时钟和卫星位置数据以外的天文年历数据（其实质上描述了卫星轨道的长期模型）来缩短。 Acquiring the satellite time data provided by the almanac data other than the positions of celestial bodies, and the satellite position data clock (which substantially describe the long-term orbit model) to shorten. 天文年历数据可在无线网络上提供， 并当从卫星接收新数据时定期更新。 Almanac data may be provided over the wireless network, and when receiving new data from the satellites periodically updated. 通过让GPS接收器知道何时特定卫星可能在上方并且对GPS接收器可见，天文年历数据使得GPS接收器能够搜索特定卫星，由此减少搜索时间。 By allowing the GPS receiver to know when a particular satellite may be above and visible to the GPS receiver, GPS almanac data so that the receiver can search for a particular satellite, thereby reducing the search time. 为了改进基于GPS的通信系统的性能，已经开发了高级定位技术。  In order to improve the communication system based on GPS performance, advanced targeting techniques have been developed. 一个这种技术被称作辅助GPS或A-GPS技术，其一般指其中外部源（如辅助服务器和参考网络）辅助GPS 接收机执行进行范围测量、得出位置结果等需要的任务的系统。 One such technique is called Assisted GPS or A-GPS technology, which generally refers to the tasks which the system requires an external source (e.g., reference network, and secondary server) for assisted GPS receiver to perform range measurements, derive position results and the like. A-GPS系统有希望是成本经济并且时间经济的方法，其用于使用无线网络来分发帮助或辅助数据给GPS接收器，特别地，在如蜂窝手机的移动站中集成的GPS接收器。 A-GPS system is desirable economical and time cost economical method for using a wireless network help or assistance data distributed to a GPS receiver, in particular, integrated in a cellular handset, such as a GPS receiver in the mobile station. 常规的A-GPS的实现为本领域技术人员所熟知，并因此不必在此详细描述。 Conventional A-GPS achieve the skilled person in the art, and therefore need not be described in detail. 简单来说，在A-GPS实现中，通过利用无线网络中并入的GPS接收器、并且估计移动站的位置（例如移动站位于其中的小区或扇区），移动站将接收的GPS信号可被预测，并且该信息可被传输到移动站。 Briefly, A-GPS implementations, the wireless network by using a GPS receiver incorporated in, and the estimated position of the mobile station (e.g. mobile station is a cell or sector therein), the mobile station may be received GPS signal It is predicted, and this information may be transmitted to the mobile station. 这种辅助的使用大大减少了搜索空间的大小，并将首次定位时间（TTFF)缩短到几秒钟并且潜在地一秒钟或更少。 This greatly reduces the use of auxiliary size of the search space, and time to first fix (TTFF) is reduced to a few seconds and potentially a second or less. 此外，移动站中的A-GPS接收器可以检测和解调信号，该信号量级弱于由常规GPS接收器请求的那些。 In addition, the mobile station A-GPS receiver may demodulate and detect a signal magnitude weaker than those requested by a conventional GPS receiver. 此外，尽管移动站可以配备有具有完整的A-GPS接收器的所有功能的芯片，但是在允许A-GPS的移动站中仅仅需要部分A-GPS接收器。 In addition, although the mobile station may be equipped with a chip having a full A-GPS receiver all the features, but allowing the A-GPS mobile station only needs section A-GPS receiver. 在后面的情况中，卫星数据经过移动网络下载，并且移动站中的GPS接收器每次需要数据时接收计算位置所需的数据。 In the latter case, the satellite data downloaded via the mobile network, and receives data necessary for calculating the position of the mobile station is required each time the GPS receiver data. 在工业预想的A-GPS系统的典型架构中，该系统包括：移动站，其位置被搜寻并且其被配备有部分GPS 接收器；A-GPS服务器，其被配备有参考GPS接收器，该参考GPS接收器能够获取与移动站相同的卫星；以及无线网络基础结构，其包括蜂窝基站和移动交换中心。 In industrial expected typical architecture for A-GPS system, the system comprising: a mobile station, its position is tracked down and which is provided with a portion of the GPS receiver; A-GPS server, which is equipped with a reference GPS receiver, the reference the GPS receiver can obtain the same satellite and the mobile station; and a wireless network infrastructure that includes a base station and a mobile switching center. A-GPS服务器从移动交换中心获得移动站的估计位置（例如，在小区和扇区的级别），监视从由移动站可见的GPS卫星获得的信号，从移动站收集特定的测量，收集位置结果，并且将结果传达给移动站。 A-GPS server obtains the mobile station from the mobile switching center position estimate (e.g., in a cell and a sector level), the monitoring signal obtained from the mobile station seen from the GPS satellite, measurements collected from a specific mobile station, collecting position result and the results communicated to the mobile station. 由A-GPS和其他常规GPS技术的高级置换（permutation)提供的优点，如改进的精确性、减小的定位解决时间以及较低的成本，使得这些高级的定位技术对于结合基于位置的服务使用有吸引力。  The advantages offered by the advanced A-GPS and other substitutions conventional GPS technology (Permutation), such as improved accuracy, reduced location solution time and low cost, so that these advanced location-based positioning technology for binding the service uses attractive. 理想地，能够提供并分发基于位置的服务的系统应当能够管理大量地理区域上的大量移动站，而无需昂贵的额外网络基础结构的扩建，并且无需加重现有基础结构的负担。 Ideally, it should be able to provide and distribute a large number of mobile stations capable of managing a large geographical area of ​​location-based services system, without the need for expensive additional expansion of network infrastructure, and without increasing the burden on the existing infrastructure. 在当前用于将GPS技术与无线网络集成的开发方法中，对移动站位置的请求启动获取和修正GPS数据，以及产生计算移动站的最终位置解决方案所需的任何辅助或帮助数据。 For the current GPS technology with a wireless network integrated development process, a request for starting the mobile station acquires position and GPS correction data, and generating a final calculated position of the mobile station or to help resolve any ancillary data required for the program. 在这样的系统中，可以认识到，大量用户的大量定位请求可能具有显著加重涉及的网络的负担、并因此消除了由采用的定位技术引起的优点的潜能。 In such a system can be appreciated, locating a large number of requests may have a large number of users increased significantly burden the network involved, and thus eliminating the potential of the location technology employed due to the advantages. 因此，需要一种分布式GPS处理系统，并且具体地一种实现基于定位的服务的系统，其克服了上述和先前经历的其他缺点。  Thus, GPS requires a distributed processing system, and in particular for implementing the service-based positioning system, which overcome the above and other disadvantages previously experienced. 具体地，需要一种系统，其将仅仅一组辅助数据分发到相同位置区域中的所有A-GPS用户，无需如当前A-GPS技术中复杂的点对点基础结构和小区广播位置方法。 In particular, a need for a system which will distribute only one set of auxiliary data to all users in the same A-GPS location area, such as the current without A-GPS technology in complex infrastructure and cell broadcast point location method. 描述了一种方法，用于经过网络提供基于位置的信息。  describes a method for providing location-based information via the network. 在该方法中，对应于多个分别的位置区域的多个GPS参考数据组在各间隔获取，使得每个GPS参考数据组持续更新。 In this method, a plurality of corresponding to a plurality of GPS reference data sets are acquired location areas in each of the intervals, such that each GPS reference data set is continuously updated. 多个辅助数据组基于各自的GPS数据组在各间隔产生，由此每个辅助数据组持续更新。 A plurality of auxiliary data sets based on the respective GPS data sets produced in each interval, whereby each group of auxiliary data continuously updated. 产生的辅助数据组在各间隔存储在数据存储网络服务器上，由此更新的辅助数据组经由与数据存储网络服务器的通信，对请求实体访问持续可用。 Generating auxiliary data sets on a data storage network server, thereby updating the auxiliary data sets and the data storage via a communication network server, continuously available to the requesting entity in the access interval storage. 根据公开的主题的另一方面，描述了一种方法，用于经过网络提供基于位置的信息。  According to another aspect of the disclosed subject matter, a method is described, via a network for providing location-based information. 在该方法中，对应于多个各自的局部区域的多个GPS参考数据组在各间隔获取，使得每个GPS参考数据组持续更新。 In this method, in each of the corresponding intervals to obtain a plurality of respective local areas of the plurality of GPS reference data sets, such that each GPS reference data set is updated continuously. 多个辅助数据组基于各自的GPS数据组在各间隔产生，由此每个辅助数据组持续更新。 A plurality of auxiliary data sets based on the respective GPS data sets produced in each interval, whereby each group of auxiliary data continuously updated. 产生的辅助数据组在各间隔存储在数据存储网络服务器上，由此更新的辅助数据组持续可用。 Generating auxiliary data sets on a data storage network server, whereby updated continuously available auxiliary data sets stored in the respective intervals. 响应于位于局部区域之一的移动站的位置的请求，基于移动站位于其中的局部区域选择存储的辅助数据组，并且选择的辅助数据组被利用来计算指示移动站的位置的最终的位置结果。 In response to the request in one of the local area of ​​the mobile station location, the mobile station is located based on a local area where the auxiliary data sets stored in the selection, and selects the auxiliary data sets being used to calculate the final position result indicative of position of the mobile station . 根据公开的实现，描述了一种系统，用于经过网络提供基于位置的信息。  The disclosed implementations, describes a system for providing location-based information via the network. 该系统可包括=A-GPS服务器、与A-GPS服务器通信的数据存储网络服务器、以及与数据存储网络服务器通信的LBS应用中心。 The system may include a server = A-GPS, A-GPS server communicating with the network server data storage, and the LBS application center communicating with a network server data storage. A-GPS服务器适配于产生对应于多个局部区域的辅助数据组， 并且计算位于局部区域之一中的移动站的最终的位置结果。 A-GPS server adapted to generate a plurality of auxiliary data sets corresponding to the local regions, and calculates the final position result located one local area of ​​the mobile station. 数据存储网络服务器适配于从A-GPS服务器接收辅助数据组，并且存储辅助数据组。 A data storage network server adapted to receive auxiliary data sets from the A-GPS server and storing auxiliary data sets. LBS应用中心适配于将选择的辅助数据组转移到移动站，并且将位置结果从移动站转移到数据存储网络服务器，用于由A-GPS 服务器在计算最终的位置结果中使用。 LBS application center adapted to transfer the selected auxiliary data sets to the mobile station, and the position result from the mobile station to a network server data storage, for use by the A-GPS server in computing the final position result in. 在一些情况中，移动站的最终位置可在移动站内计算，并且转移到LBS应用中心，用于直接的应用，而无须使A-GPS服务器修正位置结果。 In some cases, the final location of the mobile station can be calculated in the mobile station, and transferred to the LBS application center, for direct application, without A-GPS server to make the correction position result. 在检查了下面的附图和详细描述后，本发明的其他系统、方法、特征和优点对本领域的技术人员将是或将变得明显。  After reviewing the following detailed description and accompanying drawings, the present invention, other systems, methods, features and advantages of the skilled in the art will be or will become apparent. 意图在于所有这些额外的系统、方法、特征和优点被包括在本说明书中，包括在本发明的范围中，并且由权利要求保护。 It is intended that all such additional systems, methods, features and advantages be included within this description, within the scope of the present invention, and protected by the following claims. 通过参照下面的附图，本发明可以更好地理解。  by reference to the following drawings, the present invention may be better understood. 附图中的组件不必按比例确定，而是将重点放在图示本发明的原理上。 Components in the drawings are not necessarily to scale determination, emphasis instead being placed upon illustrating the principles of the present invention. 在附图中，同样的参考标号遍及不同视图代表相应的部分。 In the drawings, like reference numerals throughout the different views representative of corresponding parts. 图3是图示根据本公开的实现、用于经过网络提供基于位置的信息的方法的流程图。  FIG. 3 is a diagram illustrating implementation of the present disclosure, a flowchart of a method for providing through the network of the information based on location. 具体实施方式 在下面的描述中，参照形成其部分的附图，并且附图中通过图示其中可实现本发明的一个或更多特定示例性实施例来示出。 DETAILED DESCRIPTION  In the following description, with reference to the accompanying drawings which form a part hereof, and may be implemented in one or more specific exemplary embodiment of the present invention is shown by way of illustration wherein. 要理解到，可以利用其他的实施例，并且可以进行结构改变，而不背离本发明的范围。 It is to be understood that other embodiments may be utilized and structural changes may be made without departing from the scope of the invention. 根据一个方面公开的主题提供了一种系统架构和方法，其将A-GPS定位延伸超越工业中当前正采用和开发的点对点和小区广播定位服务。  The architecture provides a system and method relating to an aspect of the disclosure, which extends beyond the A-GPS positioning is currently employed in the industry and the development point and cell broadcast location services. 现在将参照图1和2描述主题实现的实例，图1和2是用于经过如TCP/IP网络的网络（例如，因特网、万维网等）提供基于位置的服务（LBS)系统的系统100的示意表示。 2 will now be described with reference to FIGS relating to implementation example 1, Figures 1 and 2 are used, such as via TCP / IP network of networks (e.g., Internet, World Wide Web) provides a schematic of the location-based services (LBS) system 100 of the system representation. 系统100包括一个或更多基于位置的服务（LBS服务)区域110。  The system 100 includes one or more location-based services (LBS service) area 110. LBS服务区域110可组成例如用于企业应用、WASP网络、移动虚拟网络运营商等的区域。 LBS service area 110 can be composed of regions such as enterprise applications, WASP network, mobile virtual network operators, etc. is provided. 如图2中图示， 每个LBS服务区域110可包括多个局部区域GPS参考数据中心212。 As illustrated in FIG 2, each LBS service area 110 may include a plurality of local area GPS reference data center 212. 每个局部区域GPS参考数据中心212经过如例如RS232数据链接的适当的通信链接216，与局部GPS参考接收器214通信。 Each local area GPS reference data center 212 via an appropriate communication link such as, for example, RS232 data link 216, the local GPS reference receiver 214 communications. 每个局部GPS参考接收器214利用其自身的GPS天线218来从多个可见的GPS 卫星120经由空中传输持续接收GPS数据。 Each local GPS reference receiver 214 using its own GPS antenna 218 from a plurality of visible GPS satellites 120 continuously receives GPS data via the transmission over the air. 为方便起见，仅图示三个GPS卫星120，但将理解图示的GPS卫星120可以是更大的GPS卫星格局的部分。 For convenience, illustrated only three GPS satellites 120, it will be understood that the illustrated GPS satellite 120 may be part of a larger pattern of the GPS satellite. 每个局部区域GPS参考数据中心212收集由其对应的局部GPS参考接收器214获取的GPS数据。 Each local area GPS reference data center 212 collected by its corresponding local GPS reference receiver 214 acquires GPS data. 如本领域技术人员认识到的，每个局部区域GPS参考数据中心212当需要与其对应的局部GPS参考接收器214接口并实现该功能时，可包括电子电路、计算机软件、和/或硬件。 As those skilled in the art upon appreciated, each local area GPS reference data center 212 when it is desired to its corresponding local GPS reference receiver 214 and the interface to achieve the function, may comprise electronic circuitry, computer software and / or hardware. 收集的GPS数据可包括但不限于天体位置、天体年历、GPS时间，50比特每秒导航消息、DGPS校正、以及用于在A-GPS 定位中使用的其他类型的GPS数据。 GPS data collected may include, but are not limited to the position of celestial objects almanac, GPS time, 50 bits per second navigation message, the DGPS correction, and other types of GPS data for use in A-GPS positioning. 在给定的LBS服务区域110中的局部区域GPS参考数据中心212的数量可以根据要覆盖的具体LBS服务区域110来改变。 The number of local area GPS reference data center 212 in a given LBS service area 110 may be varied depending on the particular LBS service area 110 to be covered. 典型地，局部区域GPS 参考数据中心212在总直径上覆盖大约30-50km的地理服务区域。 Typically, a local area GPS reference data center 212 covering a geographical service area at about 30-50km overall diameter. 在其他示例性实现中， 服务区域可以大约有300-500km大。 In other example implementations, a service area may be about 300-500km large. 每个局部区域GPS参考数据中心212可与全球GPS参考网络130经由适当的数据链接132通信，该全球GPS参考网络130可包括TCP/IP ftp站点或其他参考网络。  Each local area GPS reference data center 212 may be the global GPS reference network 130 via appropriate data communication link 132, the global GPS reference network 130 may include TCP / IP ftp site or other reference networks. 全球GPS参考网络130可以是支持用于全球覆盖的GPS数据的任何网络。 Global GPS reference network 130 can support any network for global coverage of GPS data. 合适的全球GPS参考网络130的一个实例是现有的JPL参考网络，尽管主题不限于该网络的使用。 Suitable example of the global GPS reference network 130 is a conventional JPL reference network, although the subject matter is not to use the network. 全球GPS参考网络130可与第二参考数据中心134经由适当的数据链接316通信，使得第二参考数据中心134能够从全球GPS参考网络130收集GPS数据。 Global GPS reference network 130 may be the second reference data center 134 via an appropriate communication link data 316, such that the second reference data center 134 can collect GPS data from the global GPS reference network 130. 收集的GPS数据可包括但不限于天体位置、天体年历、GPS时间、每秒导航消息的位数、DGPS校正、以及用于在A-GPS定位中使用的其他类型的GPS数据。 GPS data collected may include, but are not limited to the position of celestial objects almanac, GPS time, bits per second navigation message, the DGPS correction, and other types of GPS data for use in A-GPS positioning. 如下面进一步描述的，第二GPS参考数据中心134可用作备用系统，以在局部区域GPS参考数据中心212由于硬件故障、软件故障、链接故障等而支持GPS 数据失败时、用来支持GPS参考数据。 As further described below, the second GPS reference data center 134 may be used as a backup system, if local area GPS reference data center 212 due to hardware failure, software failure, link failure or the like to support GPS data failed to support the GPS reference data. 每个局部区域GPS参考数据中心212还可与A-GPS服务器140经过适当的通信链接142(如TCP/IP链接）通信。  Each local area GPS reference data center 212 may further server 140 (e.g., TCP / IP link) communications via an appropriate communication link 142 and A-GPS. A-GPS服务器140因此可从局部区域GPS参考数据中心212 接收局部GPS参考数据（例如天体位置、天体年历、GPS时间、每秒导航消息的位数、DGPS校正、以及用于在A-GPS定位中使用的其他类型的GPS数据）。 Thus A-GPS server 140 from the local area GPS reference data center 212 receives a local GPS reference data (e.g. location of objects, objects almanac, GPS time, bits per second navigation message, the DGPS correction, and for A-GPS positioning used in other types of GPS data). A-GPS服务器140然后可与第二参考数据中心134经由适当的通信链接144(如TCP/IP链接)通信，以接收全球GPS参考数据（例如天体位置、天体年历、GPS时间、每秒导航消息的位数、DGPS校正、以及用于在A-GPS定位中使用的其他类型的GPS数据）。 A-GPS server 140 may then refer to a second data center 134 via an appropriate communication link 144 (e.g., TCP / IP link) communications, to receive global GPS reference data (e.g. location of objects, objects almanac, GPS time, navigation messages per second bits, the DGPS correction, and other types of GPS data for use in a-GPS positioning). 此外，A-GPS服务器140可与数据存储网络服务器150，如例如安全因特网服务器（例如ftp服务器或web服务器），经由适当的通信链接152 (如TCP/IP链接）通信，以使得数据能够在这两个网络组件之间转移，如下所述。 In addition, A-GPS server 140 may be a data storage network server 150, as for example secure Internet server (e.g. ftp server or web server), via an appropriate communication link 152 (e.g., TCP / IP link) communication to enable data in this transfer between two network components, as described below. A-GPS 服务器140执行多个功能。 A-GPS server 140 performs a plurality of functions. 这些功能包括：管理从局部区域GPS参考数据中心212和/或第二参考数据中心134收集的GPS参考数据，验证这些GPS数据，产生和编排GPS辅助数据的格式，用于在数据存储网络服务器150上存储，基于由移动站160输出的位置结果计算目标允许A-GPS的移动站160的最终位置，并且将该最终位置提供给数据存储网络服务器150。 These features include: management 134 collected from local area GPS reference data center 212 and / or the second GPS reference data center of the reference data, verify the GPS data, and generates GPS assistance data arrangement format, the network server in a data store 150 stored, based on the calculation result of the position of the mobile station 160 outputs a final target position of the a-GPS allows a mobile station 160, and provides the final location server 150 to the data storage network. 下面进一步描述了许多这些功能。 The following further describes many of these features. 数据存储网络服务器150管理各种基于位置的数据（包括由A-GPS服务器140提供的A-GPS数据、位置结果等）的存储。 The data storage server 150 manages various network-based data storage location (including A-GPS data provided by the A-GPS server 140, the results of the position and the like). 此外，数据存储网络服务器150可被用来管理应用站点信息、用户信息等的存储。 Further, the data stored in network server 150 may be used to store management application site information, the user information and the like. 此外，数据存储网络服务器150可被用来控制用户对数据文件的访问，并且保持跟踪访问数据的用户数量、特定用户已经访问数据的次数、计费过程等。 Further, the data stored in network server 150 may be used to control user access to data files, and holds the number of users accessing the data track, the number of times a particular user has access to the data, and the billing processes. 移动站160能够操作多个模式，包括非辅助和辅助模式，其中至少一个模式是手动或自动可选择的，其中移动站160是允许A-GPS的，用于与本公开中描述的实现兼容。  The mobile station 160 capable of operating a plurality of modes, including unassisted and an auxiliary pattern, wherein at least one mode is manual or automatic alternative, where the mobile station 160 is to allow the A-GPS, is used to describe the present disclosure compatibility. 移动站160可以例如采取下列形式：无线设备如蜂窝电话（也称为无线电话、蜂窝式电话、移动电话或移动式电话），或任何其他类型的移动设备，包括但不限于个人数字助理(“PDA”）、寻呼机、计算机、双向无线电、中继无线电（trimked radio)、专用移动无线电(“SMR”）或其需要确定位置信息的任何其他设备。 The mobile station 160 may for example take the form of: a wireless device such as a cellular phone (also called a wireless telephone, cellular telephone, mobile phone or mobile phone), or any other type of mobile device, including but not limited to a personal digital assistant ( " PDA "), pagers, computer, two-way radio, a radio repeater (trimked radio), private mobile radio (" SMR ") is determined, or any other device location information. 在蜂窝电话的情形，移动站160可利用其通信部分中的蜂窝收发器，该通信部分利用任何传输机制，包括但不限于CDMA、CDMA-2000、 W-CDMA, TDMA, FDMA, GSM、UMTS、AMPS、蓝牙、Wi-Fi和/或这些传输机制或类似机制的任何组合和延伸，运行在任何射频（“RF”）频带。 In the case of a cellular telephone, a mobile station 160 may utilize its communication portion cellular transceiver, the communication section using any transmission mechanism, including but not limited to CDMA, CDMA-2000, W-CDMA, TDMA, FDMA, GSM, UMTS, AMPS, and any combination extending Bluetooth, Wi-Fi, and / or transport of these mechanisms or similar mechanisms, running on any radio frequency ( "RF") bands. 移动站160可以是辅助的位置通信设备(“ALCD，，），如于2004 年7 月3 日提交的题为“Aided Location Communication System(辅助的位置通信系统)”的未决美国专利申请序列号10/885，507中公开的，其转让给本公开的受让人。 The mobile station 160 may be an auxiliary communication device position ( "ALCD ,,), such as in July 2004, entitled, filed May 3 of" Aided Location Communication System (the position of the auxiliary communications system), "copending U.S. Patent Application Serial No. 10 / 885,507 disclosure, which is assigned to the assignee of the present disclosure. 基于位置的服务（LBQ应用中心或服务器170与数据存储网络服务器150经由适当的通信链接172如TCP/IP链接通信，以允许这两个网络组件之间的数据传递。LBS应用中心170被提供来管理与多个网络组件的通信。LBS应用中心170与参与无线网络的任意多个移动站160通信，包括图1中图示的目标移动站160，以允许LBS应用中心170和目标移动站160之间的A-GPS数据和应用数据传递。无线网络可以是例如蜂窝电话网络，其包括多个蜂窝基站174，如由图1中图示的蜂窝基站174所表示。蜂窝基站174可以经由合适的接口176(如空中因特网或WAP IP连接）将数据分发到LBS应用中心170。LBS应用中心170管理在移动站160的数据存储网络服务器150上存储的A-GPS数据的访问。此外， LBS应用中心170可利用适当的通信链接182和192(如TCP/IP链接或其它类型的因特网链接），分别与一个或更多基于位置的  Location-based services (LBQ application center or server data store web server 150 suitable communication link 172 is transmitted as TCP / IP communications link to allow the data between the two network components via an application center 170 and 170 .LBS is provided to manage the communication with the plurality of network components .LBS application center 170 of any plurality of mobile stations 160 communicate and participate in a wireless network, as illustrated in FIG. 1 comprising the target mobile station 160, to allow the LBS application center 170 and the target mobile a-GPS data, and data transfer between the application station 160 may be a wireless network such as a cellular telephone network comprising a plurality of cellular base stations 174, as illustrated in FIG represented by cellular base station 174 1. 174 via a cellular base station suitable interface 176 (e.g., air or WAP IP Internet connection) to the center of the distribution data to the LBS application center 170 170.LBS application management access a-GPS data stored on the mobile station 150 stored in the web server 160 of the data. 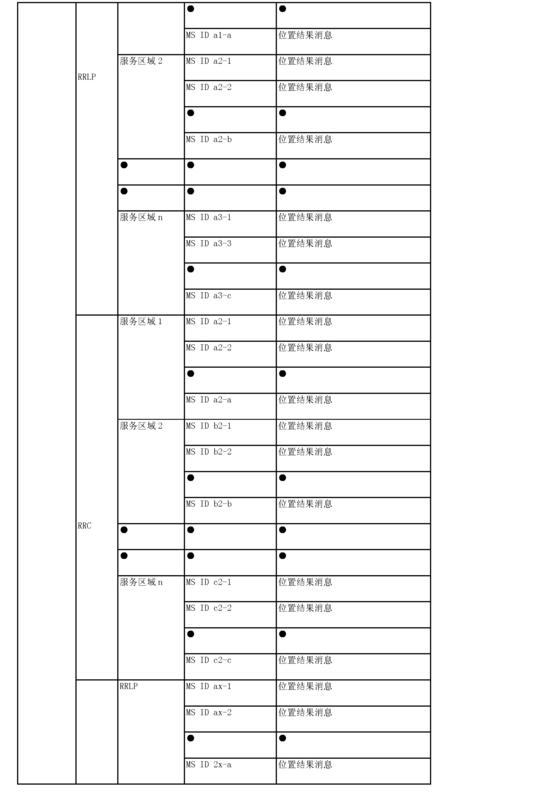 Further, LBS application center 170 may use a suitable communications link 182, and 192 (e.g., TCP / IP link or other type of Internet links), respectively, with one or more location-based 应用服务器或中心（如一个或更多GIS服务器180和/或其他应用服务器190)通信。GIS服务器180为LBS应用中心170支持地图数据、路由信息、感兴趣的点的信息等。应用服务器190基于已经对其请求位置数据的目标移动站160 计算的位置，为LBS应用中心170支持其他类型的信息，如商业相关的信息、市场相关的信息、数据库信息等，该应用服务器190可以有利地为网络应用服务器如因特网应用服务器。 这些基于位置的信息的实例可以包括但不限于，目标移动站160本地的商业或事件广告， 优惠券、票、目录等。作为选择，在适当的环境中，LBS应用中心170可许可应用服务器190直接从数据存储网络服务器150访问目标移动站160的位置信息，如图1中图示的通信链接194所示。 The application server or center (e.g., one or more GIS server 180 and / or other application servers 190) to the communication server 180 .GIS LBS application center 170 supports the map data, route information, points of interest information, etc. Based on the application server 190 thereto the position of the target mobile station requests location data 160 calculated for the LBS application center 170 supports other types of information, such as business-related information, market related information, database information, etc., the application server 190 may advantageously be a network an application server such as the Internet application server. the instance-based information location may include but are not limited to, 160 local target mobile station commercial or event advertisements, coupons, tickets, catalogs, etc. Alternatively, in appropriate circumstances, the LBS application 160 location information center 170 directly from the target mobile station access to a network server data store 190 may permit an application server 150, a communication link 194 illustrated in FIG 1 FIG. 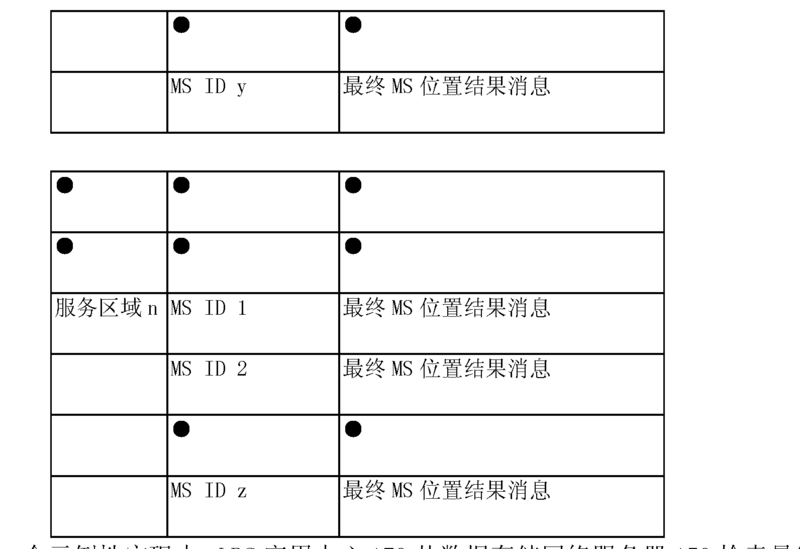 现在将描述图1和图2中图示的系统操作的实例。  Now the operation of an example system illustrated in FIGS. 21 and described below. 如前所示，每个局部区域GPS参考数据中心212管理来自GPS卫星120的原始GPS数据的收集，该GPS卫星120对相关局部覆盖区域可见。 As previously indicated, each local area GPS reference data center manager 212 from the GPS satellites to collect raw GPS data 120, the GPS satellite 120 to partially cover the relevant area is visible. 在有利的实现中，每个局部区域GPS参考数据中心212从其对应的局部GPS参考接收器214持续收集原始GPS数据。 In an advantageous implementation, each local area GPS reference data center 212 continuously collects raw GPS data from its corresponding local GPS reference receiver 214. 在该上下文中，术语“持续”可以意味着周期性地或在各时间间隔（例如每30秒钟）。 In this context, the term "continuous" may mean interval or periodically (e.g., every 30 seconds) at each time. 此外，每个局部区域GPS参考数据中心212获得其局部GPS参考接收器214的位置。 In addition, each local area GPS reference data center 212 obtains its local GPS reference receiver 214 position. 在典型的实现中，每个局部GPS参考接收器214位于其对应的局部区域GPS参考数据中心212，使得局部GPS参考接收器214的位置也是相应的局部区域GPS参考数据中心212的位置。 In a typical implementation, each local GPS reference receiver 214 in its corresponding local area GPS reference data center 212, so that the position of the local GPS reference receiver 214 is a position corresponding to the local area GPS reference data center 212. 每个局部区域GPS参考数据中心212将收集的原始GPS数据发送到A-GPS服务器140。 Raw GPS data transmitted each local area GPS reference data center 212 to the collected A-GPS server 140. 在有利的实现中，每组原始GPS数据在其获取后立刻发送到A-GPS服务器140，并且合适时在局部区域GPS参考数据中心212处理。 In an advantageous implementation, each set of raw GPS data transmitted immediately after acquiring the A-GPS server 140, the processing 212 in the local area GPS reference data center and when appropriate. 即，每个局部区域GPS参考数据中心212可以将其最近的GPS数据持续提供给A-GPS服务器140 (例如，每30秒钟）。 That is, each local area GPS reference data center 212 may be latest GPS data continuously supplied to the A-GPS server 140 (e.g., every 30 seconds). 此外，每个局部区域GPS参考数据中心212将其位置提供给A-GPS服务器140。 In addition, each local area GPS reference data center 212 provides its location to the A-GPS server 140. 以这种方式，A-GPS服务器140可以为位于由各自的局部区域GPS参考数据中心212 覆盖的服务区域内的移动站160，产生更新的位置辅助数据。 In this manner, A-GPS server 140 may be a mobile station located within the service area 160 by the respective local coverage area GPS reference data center 212 to generate updated position assist data. 在有利的实现中，来自局部区域GPS参考数据中心212的局部GPS数据和位置信息的传输以及这些数据的持续更新是由A-GPS服务器140启动的-即，A-GPS服务器140持续请求每个局部区域GPS参考数据中心212提供来自那些卫星120的最近的GPS数据，该卫星120对该特定局部区域GPS参考数据中心212可见。 In an advantageous implementation, the local GPS data and transmission data, and continuously update the location information from the local area GPS reference data center 212 is initiated by the A-GPS server 140 - that is, A-GPS server 140 continuously requests per local area GPS reference data center 212 provides the latest data from those GPS satellites 120, the satellite 120 to the particular local area GPS reference data center 212 is visible. 在局部GPS参考接收器214提供GPS数据失败的情况下，有利的实施例中的相应的局部区域GPS参考数据中心212将GPS数据收集从局部GPS参考接收器214切换到全球GPS参考网络130。 The case where  the reference receiver 214 provides GPS data fails in the local GPS, the corresponding local area GPS reference data center Examples advantageous embodiment 212 GPS data collected from a local GPS reference receiver 214 is switched to the global GPS reference network 130. 从全球GPS参考网络130收集的GPS数据将基于局部区域GPS参考数据中心212的位置，为局部可见的卫星120滤出。 GPS data from the global GPS reference network 130 based on the collected position of the local area GPS reference data center 212, the satellite 120 is a partially visible filtered off. 第二GPS参考数据中心134从全球GPS 参考网络130收集全球GPS数据，并且将数据提供给A-GPS服务器140，以响应A-GPS服务器140的请求。 The second GPS reference data center 134 collected from the global GPS reference network 130 global GPS data, and supplies the data to the A-GPS server 140 in response to the request of the A-GPS server 140. A-GPS服务器140将每个局部区域的GPS数据组或分组存储在存储位置中，并且处理数据组以产生对应于每个局部区域的辅助数据组或分组。  A-GPS server 140 or GPS data group packet storing each local region in the storage location, and the data set is processed to generate a local region corresponding to each group or auxiliary data packets. 辅助数据仅对那些位于特定局部服务区域内部的移动终端160可用。 Assistance data is available only for those mobile terminal 160 is located inside a particular local service area. 辅助数据产生无需请求实体（如移动站160)的任何请求，因为相同服务区域中的每个移动站160可以使用对该服务区域可用的辅助数据。 Without any assistance data request requesting entity (e.g., mobile station 160) because the same service area, each mobile station 160 may use the auxiliary data area available for the service. A-GPS服务器140可以将辅助数据编排格式到工业支持的任何协议类型。 A-GPS assistance data server 140 may be formatted in any type of protocol to support industry. 协议和辅助类型的实例包括但不限于下面的表格1和2提出的那些。 Examples of protocols and auxiliary type include, but are not limited to those in Table 1 and 2 below set forth. 将注意到，对于基于移动站（基于MS)辅助类型，利用A-GPS数据，位置在移动站160内部计算，并且返回到A-GPS服务器140。  It will be noted, for the mobile station based on (on MS) assisted type, using the A-GPS data, position calculation within the mobile station 160, and returns to the A-GPS server 140. 对辅助移动站（辅助MS)辅助类型，利用A-GPS数据，位置基于从移动站160返回的GPS结果，在A-GPS服务器140内部计算。 The auxiliary mobile station (auxiliary MS) assisted type, using the A-GPS data, the GPS-based position result returned from the mobile station 160 is calculated within the A-GPS server 140. 还将注意到，给定的辅助消息可以包括指示局部区域GPS参考数据中心212的位置的位置辅助数据。 Will also be noted, a given message may include a secondary position assist data indicating the position of the local area GPS reference data center 212. 一旦A-GPS服务器140将辅助数据组处理到辅助协议消息格式中，A-GPS服务器140就将辅助数据写到数据存储网络服务器150。  Once the A-GPS assistance data server 140 set to secondary processing protocol message format, A-GPS assistance server 140 will write data to the data storage network server 150. 以这种方式，为每个局部区域更新的辅助数据总是通过访问数据存储网络服务器150可获得。 In this manner, for each local region of the auxiliary data is always updated by the web server 150 accessing the data storage available. 因此，系统100不需要等待用户启动的为了计算辅助数据的位置请求，不象当前技术的系统。 Thus, the system 100 need not wait for the auxiliary data in order to calculate a user-initiated location request, unlike the current system technology. 因此可以看到，系统100的架构和操作提供许多优点。 So you can see, architecture and operating system 100 provides a number of advantages. 在为移动站160的位置做出请求的情况下，响应于请求，现有的当前辅助数据可以从数据存储网络服务器150检索-即，请求自身不需要产生辅助数据-因此减少网络延迟和创建A-GPS数据需要的时间，并且改进首次定位的时间（TTFF)以及减少数据传递需要的网络带宽。 In the case of requesting for the location of the mobile station 160 in response to the request, an existing current assistance data may be retrieved from the data storage network server 150 - i.e., the request itself does not need to generate auxiliary data - thus reducing the network delay and to create A -GPS data required time, and improve time (the TTFF) positioning the first and reducing network bandwidth required for data transfer. 写到数据存储网络服务器150的辅助数据的结构可以包括但不限于下面的表格3和4中提出的结构。 Auxiliary data written to the data storage structure of the network server 150 may include but are not limited to, the following structures in Table 3 and 4 raised. 由A-GPS服务器140产生的辅助数据可用来实现目标移动站160的位置请求。  The auxiliary data generated by the A-GPS server 140 may be used to achieve the target position of the mobile station 160 requests. 这样的请求可由与系统100通信的任何适当的请求实体做出。 Such a request may be in communication with system 100 in any suitable entity making the request. 请求实体可以是例如应用、站点、或利用移动站160的位置的终端用户，以便提供基于位置的服务（例如，地图信息、行进方向、跟踪、商业信息）或紧急服务（例如，E911服务）给移动站160的用户。 Requesting entity may be applied, for example, the site or location of an end user using a mobile station 160 in order to provide location-based services (e.g., map information, traveling direction, tracking, business information) or emergency services (e.g., the E911 service) to the user of the mobile station 160. 请求实体还可以是目标移动站160自身或搜寻目标移动站160的位置的另一移动站。 Requesting entity may also be a target mobile station 160 itself or the search for the location of the target mobile station 160 to another mobile station. 出于方便起见， 图1和2中图示的示例性系统100的操作的描述的剩余部分将假定请求实体是移动站160， 需理解由本公开包括的系统100和方法不限于该情景。 For convenience, the remainder of the operation 100 described in FIG. 1 and 2, an exemplary system illustrated will be assumed that the requesting entity is a mobile station 160, to be understood that the system 100 and method of the present disclosure includes not limited to this scenario. 在一个示例性实现中，向LBS应用中心170做出定位请求。  In one exemplary implementation, makes a location request to the LBS application center 170. 在接收了定位请求后， LBS应用中心170基于例如移动站160的ID(例如，蜂窝电话号码、企业应用的用户标签等)、并且基于移动站160的大致位置（例如，商业应用的小区位置等)，将移动站160映射到服务区域。 After receiving the location request, the LBS application center 170 based on, for example, ID (e.g., cellular phone number, business application user tags, etc.) the mobile station 160, and based on the approximate location of the mobile station 160 (e.g., cell location for commercial applications, etc. ), the mobile station 160 is mapped to the service area. 基于移动站160的ID和/或其他类型的信息，LBS应用中心170还可以确定要为移动站160使用哪个辅助协议。 Based on the ID and / or other types of information, LBS application center 170 may also be used to determine the mobile station 160 to which the mobile station 160 of the secondary protocol. 一旦已经确定适当的辅助协议并且识别服务区域，LBS 应用中心170就访问在数据存储网络服务器150上存储的服务区域目录，并且检索属于目标移动站160位于其中的区域的辅助数据。 Once it has been determined the appropriate secondary protocols and identify the service area, the LBS application center 170 accesses the directory service area on the data storage 150 stores the network server, and retrieves the target mobile station belonging to the auxiliary data area 160 is located therein. LBS应用中心170将辅助数据从数据存储网络服务器150传递到移动站160作为数据分组，而无需对该数据解码和重编排格式。 The LBS application center 170 passing the auxiliary data from the data storage server 150 to the mobile station network 160 as a data packet, without decoding the data and re-formatting. LBS应用中心170还可以选择将服务区域ID加到辅助消息，并且服务区域ID可附到由移动站160 返回的位置结果消息。 LBS application center 170 can also select the service area to the auxiliary message ID, and the service ID may be attached to the area by the mobile station 160 returns to the position result message. LBS应用中心170可以快速地将位置结果传递到数据存储网络服务器150中的适当的目的地。 LBS application center 170 can be quickly transmitted to the appropriate position result 150 of the data storage destination in the network server. 在一个示例性实现中，移动站160是允许A-GPS的，并因此A-GPS单元与移动站160集成，如由图1中图示的GPS天线196表示。  In one exemplary implementation, the mobile station 160 is to allow the A-GPS, A-GPS and thus the mobile station 160 and the integrated unit, as represented by the illustrated in FIG. 1 GPS antenna 196. 系统100中可采用任何合适的移动站160。 The system 100 may be employed in any suitable mobile station 160. 实例包括但不限于蜂窝电话、PDA、寻呼机、手持设备、便携式计算机等。 Examples include, but are not limited to a cellular phone, PDA, pager, handheld device, portable computer or the like. 在接收辅助数据后， 目标移动站160可遵循常规的A-GPS定位方法，以解码辅助数据然后将辅助数据传递到与移动站160相关联的A-GPS单元。 After receiving the assistance data, the target mobile station 160 may follow a conventional A-GPS positioning method to decode the auxiliary data and then passed to the A-GPS assistance data to the mobile station unit 160 is associated. A-GPS单元可利用辅助数据，遵循任何常规的A-GPS定位方法，以计算位置结果（例如，对于基于MS模式为X、Y、Z中的位置；对于辅助MS模式为GPS结果）。 A-GPS assistance data unit may use, follow any conventional A-GPS positioning method to calculate the position result (e.g., MS-based mode for X, Y, Z in position; for MS-assisted GPS mode results). 作为包括内建A-GPS单元的替代，移动站160可被提供能够经由无线或有线数据链接连接到本地A-GPS附件，即，外部A-GPS单元。 As can be connected alternatively comprise a built-A-GPS unit, mobile station 160 may be provided via a wireless or wired data link to the local A-GPS attachments, i.e., an external A-GPS unit. 在任一种情况中，移动站160的计算位置的结果遵循任何常规方法封装在合适的协议消息中并发送到LBS应用中心170。 In either case, the result of the calculation of the position of the mobile station 160 to follow any conventional method of packaging in a suitable protocol message sent to the LBS application center 170. 如果移动站160接收辅助消息中的服务区域ID，则移动站160还可以与位置结果一起返回服务区域ID。 If the mobile station 160 receives the service area of ​​the auxiliary message ID, the mobile station 160 may also return the service area ID with the position result. 一旦LBS应用中心170从移动站160接收位置结果，LBS应用中心170就确定其中移动站160驻留的服务区域。  Once the LBS application center 170 receives the position result from the mobile station 160, the LBS application center 170 determines that the service area where the mobile station 160 resides. LBS应用中心170然后基于先到先服务原则将位置结果消息发送到数据存储网络服务器150。 LBS application center 170 and then based on the principle of first come first serve to transmit position result message server 150 to the data storage network. 在示例性实现中，将注意到LBS应用中心170自身不需要解码和编码协议消息中的位置结果。 In an exemplary implementation, the results will be noted that the position of the LBS application center 170 itself does not require encoding and decoding of protocol messages. 此外，位置结果以一个协议消息格式返回，而无论它是基于MS的还是辅助MS的。 Further, the position result returned in a protocol message format, whether it is based on the MS-assisted or MS. A-GPS服务器140不需要使用位置模式消息（基于MS或辅助MS)来计算移动站160的位置。 A-GPS server 140 without the use of position location mode message (MS-based or MS assisted) to the mobile station 160 is calculated. 为了商业应用，LBS应用中心170可在多于一个协议(例如，RRLP, RRC、IS-801等）中接收位置结果。 For commercial applications, LBS application center 170 may receive the position result in more than one protocol (e.g., RRLP, RRC, IS-801, etc.). 然而，基于终端ID，LBS应用中心170能够确定在位置返回消息中使用哪种类型的协议，并因此位置结果消息可以存储在数据存储网络服务器150中的基于协议的目录中。 However, based on the terminal ID, LBS application center 170 can determine what type of protocol used in the location return message, and thus the position result message can be stored in the data storage 150 of the network server directory based protocol. 写到数据存储网络服务器150的位置结果的数据结构，可以包括但不限于下面的表格5和6中提出的结构。  The structure of the data written to the data storage position in the result of the network server 150 may include but are not limited to, the following structures in Table 5 and 6 set forth. 在一个示例性实现中，LBS应用中心170从数据存储网络服务器150检索最终的位置信息。  In one exemplary implementation, LBS application center 170 retrieves the location information of the final web server 150 from the data storage. LBS应用中心170可以使用目标移动站160的最终的位置信息以及ID(例如， 蜂窝电话号码），以产生目标移动站160的基于位置的应用或服务，例如通过与GIS服务器180接口来获得街道地图、感兴趣的点、街道路径信息等，和/或与内容或服务提供者的应用服务器190接口以产生属于目标移动站160的确定的位置的内容（例如，广告、优惠券、 票、本地商业、交通、或天气信息等）。 LBS application center 170 can use the target mobile station final position information and the ID (e.g., cell phone number) 160, to produce the target mobile station-based application or service location 160, for example by the GIS server 180 interface to obtain a street map , point, street path information, and / or content or service provider application server 190 interfaces to generate interest in belonging to the target mobile station to determine the location of the content 160 (eg, advertising, coupons, tickets, local business , traffic or weather information, etc.). 本领域技术人员可以认识到，一旦目标移动站160的最终位置和ID在LBS应用中心170使得可用，就可以开发各种不同类型的位置服务和内容应用，用于向请求实体呈现。 Those skilled in the art will recognize that the final position and once the ID of the target mobile station 160 the LBS application center 170 that is available, can develop a variety of different types of location services and applications content, for presentation to the requesting entity. 现在参照图3，图示了用于经过网络提供基于位置的信息的方法的一个实例。  Referring now to Figure 3, there is illustrated one example of a method for providing a network-based information via the position of FIG. 该方法在块300开始，并且在块305，获取GPS参考数据。 The method begins at block 300 and at block 305, GPS reference data acquisition. 数据可被特征化为组或分组，每个数据组或分组对应区域（例如，小区、扇区、子扇区、束等）。 Data may be characterized as a group or packet, each data packet group, or a corresponding region (e.g., cell, sector, sub-sectors, beams, etc.). 在块310，对获取的每组GPS参考数据，产生对应的辅助数据组。 At block 310, for each GPS reference data acquired to produce the corresponding auxiliary data sets. 在块320，这样产生的辅助数据组以一种方式存储在一位置，使得数据能够由位置请求实体访问。 At block 320, the auxiliary data sets in a manner so generated are stored in a location so that the data can be requested by the entity to access location. 该方法然后在块325结束。 The method then ends at block 325. 例如，如上所述，辅助数据可以存储在数据存储网络服务器150上。  For example, as described above, the auxiliary data may be stored on the data storage network server 150. 因此，辅助数据在位置请求做出时可用，即，在块300、310和320中概述的行为不必响应于位置请求启动。 Thus, the auxiliary data is made available when a location request, i.e., at block 300, 310 and 320 conduct outlined necessarily start in response to a location request. 如上所述，块300、310和320中概述的行为以规则的间隔重复，从而为访问使得可用的辅助数据对任何给定位置（搜寻其位置的移动站160位于该给定位置中）更新，这一点是有利的。 As described above, blocks 300, 310 and 320 conduct outlined repeated at regular intervals, so that the access to the auxiliary data is available for any given position (search position of the mobile station 160 is located in the given position) update, this is advantageous. 前述系统100和其操作可提供超越经过网络或各网络创建和分发基于位置的信息的现有技术方法的许多优点。  100 and the system operator can provide a number of advantages that go beyond the prior art method each network or through the network to create and distribute the information based on location. 例如，消除了传统地A-GPS数据跨越网络转移所需的复杂的基础架构。 For example, eliminating the complex infrastructure Conventionally A-GPS data needed to transfer across the network. 减少了网络延迟和创建A-GPS数据需要的时间、以及数据传递需要的网络带宽。 Reducing the network delay and A-GPS data creation time required, and the required data transfer bandwidth. 缩短了首次定位时间。 Shorten the time to first fix. 企业和商业应用的LBS解决方案易于扩展。 Enterprise and commercial applications of LBS solutions easy to expand. 此外，系统100提供了经济和容易的方法来为内容提供者产生基于位置的收益。 In addition, the system 100 provides an economical and easy way to generate location-based provider of revenue for content. 系统100通过到数据存储网络服务器150的访问历史便利追踪A-GPS交易，并由此便利计费过程。 100 to the data storage system via a network to facilitate access history server 150 A-GPS tracking transactions, and thus facilitate the billing process. 18程、或过程步骤，可以由硬件和/或软件执行。 18 process, or process step may be performed by hardware and / or software. 如果由软件执行该过程，则软件可驻留在可变调制单播系统中的软件存储器（未示出）内。 If the process is executed by software, the software may reside in software memory variable modulation unicast system (not shown). 软件存储器中的软件可包括可执行指令的有序列表，用于实现逻辑功能（即，可以数字格式（如数字电路或源代码）或模拟格式（如模拟电路或模拟源，如模拟电、声音、或视频信号）实现的“逻辑”），并且可选择性地体现在任何计算机可读（或信号承载）介质中，用于由或结合指令执行系统、装置、或设备，如基于计算机的系统、包括处理器的系统、或可以选择性地从指令执行系统、装置、或设备取出指令并执行指令的其他系统使用。 Software The software in memory may include an ordered listing of executable instructions for implementing logical functions (i.e., may be a digital format (such as digital circuitry or source code) or analog format (e.g., analog circuitry or an analog source such an analog electrical, sound or the video signal) implemented as "logic"), and is selectively be embodied in any computer-readable (or signal-bearing) medium for use by or in connection with the instruction execution system, apparatus, or device, such as a computer-based system other systems, comprising a system processor, or may be selectively executed from the instruction execution system, apparatus, or device and execute the instructions taken out of use. 在本说明书的上下文中，“计算机可读介质”和/或“信号承载介质”是可以包含、存储、传达、传播或传输程序用于由或结合指令执行系统、装置或设备使用的任何装置。 In the context of this specification, a "computer-readable medium" and / or "signal-bearing medium" can contain, store, communicate, propagate, or transport the program for use by or in conjunction with the instruction execution system, apparatus, apparatus, or device. 计算机可读介质可以选择性地为例如但不限于电、磁、光、电磁、红外、 或半导体系统、装置、设备或传播介质。 The computer-readable medium may selectively be, for example, but not limited to, an electronic, magnetic, optical, electromagnetic, infrared, or semiconductor system, apparatus, device, or propagation medium. 计算机可读介质的更多特定实例，但非穷尽列表，将包括下述：具有一条或更多线的电连接（电）、便携式计算机磁盘（磁）、RAM(电）、只读存储器“ROM”（电）、可擦除可编程只读存储器（EPR0M或闪存）（电）、光纤（光）、以及便携式致密盘只读存储器“CDR0M”（光）。 More specific examples of computer-readable media, but non-exhaustive list, comprising: one or more line having an electrical connection (electronic), a portable computer diskette (magnetic), RAM (electricity), a read only memory "ROM "(e), an erasable programmable read only memory (EPR0M or Flash memory) (electronic), an optical fiber (optical), and a portable compact disc read-only memory" CDR0M "(light). 注意到计算机可读介质甚至可以是纸质或在上面打印程序的另外的合适介质，如程序可经由例如纸或其他介质的光扫描以电方式获取，然后需要时以合适的方式编译、解释或其他处理，然后存储在计算机存储器中。 Noted that the computer-readable medium could even be paper or another suitable medium on top of the program is printed, as the program may be acquired via the electrically optical scanning, such as paper or other medium, then if necessary to compile a suitable manner, interpreted or other processing, and then stored in a computer memory. 尽管上面的描述指基于GPS的通信系统的使用，然而主旨不限于该系统。  Although the above description refers to the use of GPS-based communications systems, but is not limited to the gist of the system. 任何可以从由上述网络组件（如数据存储网络服务器150和LBS应用中心170)提供的功能获益的定位技术，可以在系统100中实现。 Any may benefit from the functionality provided by said network components (e.g., web server 150 and data storage LBS application center 170) location technology, may be implemented in the system 100. 此外，将理解到，上面的实现的描述已经为图示和描述目的呈现。  Further, it will be appreciated that the above description of implementations has been presented for purposes of illustration and description. 其不是穷举性的，并且不将寻求保护的发明限制在公开的精确形式。 It is not exhaustive and does not seek to limit the claimed invention to the precise forms disclosed. 根据上面的描述各种修改和变化是可能的，并且可以从实现本发明获取。 The above described modifications and variations are possible, and may be obtained from the implementation of the present invention. 权利要求和其等效定义了本发明的范围。 Claims and their equivalents define the scope of the invention. 1. 一种用于经过网络提供基于位置的信息的方法，该方法包括：在各间隔获取多个GPS参考数据组，该多个GPS参考数据组对应多个各自的局部区域， 由此每个GPS参考数据组持续更新；基于各自的GPS数据组在各间隔产生分别对应于每个局部区域的多个辅助数据组，由此每个辅助数据组持续更新；以及在各间隔将产生的辅助数据组存储在数据存储网络服务器上，由此更新的辅助数据组经由与数据存储网络服务器的通信，对请求实体的访问持续可用，其中所述请求实体包括辅助GPS客户，并且其中所述更新的辅助数据组，由所述辅助GPS客户用于为与所述辅助GPS客户关联的移动站确定GPS定位解决方案。 CLAIMS 1. A method for providing network through location-based information, the method comprising: acquiring a plurality of GPS reference data sets at intervals each of the plurality of GPS reference data sets corresponding to a plurality of respective local areas, whereby each GPS reference data set is continually updated; based on the respective GPS data sets are generated corresponding to each local region of the plurality of auxiliary data sets in the interval, whereby each auxiliary groups continually updated; and generated in the auxiliary data interval group stored on the data storage network server, thereby updating the auxiliary data sets and the data storage via a communication network server, the entity requesting access to continuously available, wherein said auxiliary wherein said updating comprises assisted GPS client requesting entity, and data set used by the client to determine a GPS assisted GPS positioning associated with the secondary customer's mobile station GPS solutions. 2.如权利要求1所述的方法，其中所述获取包括从服务各自的局部区域的多个局部GPS参考数据中心检索GPS数据。 2. The method according to claim 1, wherein said obtaining comprises retrieving data from the GPS respective local service area of ​​a plurality of local GPS reference data centers. 3.如权利要求2所述的方法，其中多个局部GPS参考数据中心与各自的局部GPS参考接收器通信，该局部GPS参考接收器适配来从一个或更多GPS卫星获取GPS信号。 The method according to claim 2, wherein the plurality of local GPS reference data centers respective local GPS reference receiver in communication with a local GPS reference receiver adapted to acquire the GPS signals from one or more GPS satellites. 4.如权利要求2所述的方法，其中所述检索包括操作A-GPS服务器，以从每个局部GPS 参考数据中心请求GPS数据。 4. The method according to claim 2, wherein said retrieving operation comprises A-GPS server to request GPS data from each local GPS reference data centers. 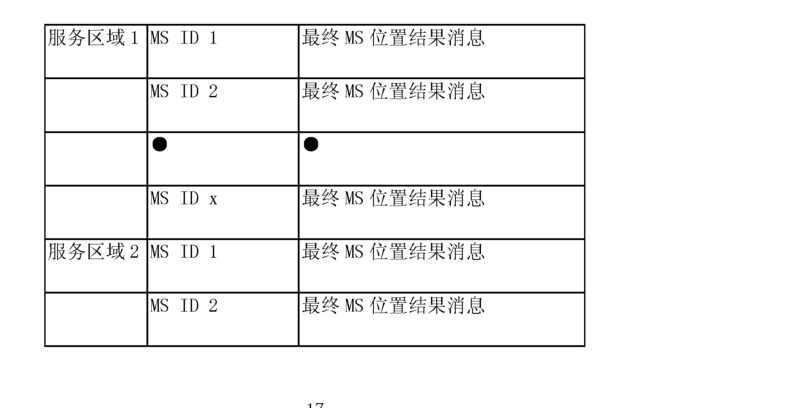 5.如权利要求1所述的方法，其中所述产生包括操作A-GPS服务器。 5. The method according to claim 1, wherein said operation comprises generating A-GPS server. 6.如权利要求5所述的方法，包括将产生的辅助数据组从A-GPS服务器发送到数据存储网络服务器。 The method according to claim 6, comprising the auxiliary data sets generated from the A-GPS server transmits data to a network storage server. 7.如权利要求1所述的方法，其中数据存储网络服务器包括web服务器。 7. The method according to claim 1, wherein the data storage network server includes a web server. 8.如权利要求1所述的方法，其中数据存储网络服务器包括ftp服务器。 8. The method according to claim 1, wherein the data storage comprises a network server ftp server. 9.如权利要求1所述的方法，包括从请求实体接收对移动站的位置的请求，并且响应于该请求，基于移动站位于其中的区域，从多个产生的辅助数据组选择辅助数据组。 9. The method of claim 1, comprising receiving a request from a requesting entity on the location of the mobile station, and in response to the request, based on the region in which the mobile station is located, the auxiliary data sets generated from the selected plurality of auxiliary data sets . 10.如权利要求9所述的方法，包括将选择的辅助数据组从数据存储网络服务器发送到移动站。 10. The method according to claim 9, comprising selecting a set of auxiliary data transmitted from the data stored in the network server to a mobile station. 11.如权利要求9所述的方法，其中该请求实体包括移动站。 11. The method according to claim 9, wherein the requesting entity comprises a mobile station. 12.如权利要求9所述的方法，其中该请求实体包括应用服务器。 12. The method according to claim 9, wherein the requesting entity comprises an application server. 13.如权利要求9所述的方法，其中所述选择包括操作与移动站和数据存储网络服务器通信的基于位置的服务应用中心。 13. The method according to claim 9, wherein the selected application comprises a location-based service center in operative communication with a mobile station and a network server data storage. 14.如权利要求9所述的方法，包括基于选择的辅助数据组计算位置结果，并且将位置结果存储在数据存储网络服务器上。 14. The method according to claim 9, comprising calculating a position result based on the selected set of auxiliary data, and the result is stored on the data storage location server in the network. 15.如权利要求14所述的方法，其中计算位置结果包括操作与移动站集成的A-GPS单兀。 15. The method according to claim 14, wherein calculating a position result comprises operating a mobile station with an integrated A-GPS single Wu. 16.如权利要求14所述的方法，其中计算位置结果包括操作与移动站通信的外部GPS单元。 16. The method according to claim 14, wherein calculating a position result comprises operating an external GPS unit communicating with a mobile station. 17.如权利要求14所述的方法，包括基于先前计算的位置结果计算最终的位置结果， 并且将最终的位置结果存储在数据存储网络服务器上。 17. The method as claimed in claim 14, comprising computing the final position result based on the position previously calculated results and the final result is stored in the location on the data storage network server. 18.如权利要求17所述的方法，其中计算最终的位置结果包括操作与数据存储网络服务器通信的A-GPS服务器。 18. The method according to claim 17, wherein computing the final position result comprises the A-GPS server communicating with the data storage operation of the network server. 19.如权利要求17所述的方法，包括为存储在数据存储网络服务器上的新位置结果持续扫描数据存储网络服务器，计算对应于找到的每个新位置结果的最终的位置结果，并且将最终的位置结果存储在数据存储网络服务器上。 19. The method according to claim 17, comprising a location for the new result is stored on the data storage network server continuously scanned data network server, the new position is calculated corresponding to each of the results found in final position result, and the final the result is stored in the location on the data storage network server. 20.如权利要求19所述的方法，其中扫描包括操作与数据存储网络服务器通信的A-GPS服务器。 20. The method according to claim 19, wherein the scanning comprises the A-GPS server communicating with the data storage operation of the network server. 21.如权利要求17所述的方法，包括基于计算的最终位置结果产生基于位置的服务信息，并且将基于位置的服务信息发送到请求实体。 21. The method according to claim 17, comprising a location based service information, sent to the requesting entity and the location based service information to the final position is generated based on the result of the calculation. 22.如权利要求21所述的方法，其中该请求实体包括移动站。 22. The method according to claim 21, wherein the requesting entity comprises a mobile station. 23.如权利要求21所述的方法，其中该请求实体包括应用服务器。 23. The method according to claim 21, wherein the requesting entity comprises an application server. 24.如权利要求21所述的方法，其中产生基于位置的服务信息包括从数据库检索基于位置的服务数据，并且基于计算的最终位置结果产生基于位置的服务应用。 24. The method according to claim 21, wherein the generating location based service information comprises location-based service applications to retrieve location-based services data from the database, and generates a final position based on the result of the calculation. 25.如权利要求M所述的方法，其中检索基于位置的服务数据包括访问基于位置的服务应用服务器。 25. The method of claim M, wherein the retrieved data includes a location-based service access location-based services application server. 26.如权利要求25所述的方法，其中基于位置的服务应用服务器包括GIS服务器。 26. The method according to claim 25, wherein the location-based services application server comprises a GIS server. 27.如权利要求25所述的方法，其中基于位置的服务应用服务器包括因特网应用服务器。 27. The method according to claim 25, wherein the location-based services application server comprises an Internet application server. 28. 一种用于经过网络提供基于位置的信息的方法，该方法包括：在各间隔获取多个GPS参考数据组，该多个GPS参考数据组对应多个各自的局部区域， 由此每个GPS参考数据组持续更新；基于各自的GPS数据组在各间隔产生分别对应于每个局部区域的多个辅助数据组，由此每个辅助数据组持续更新；以及在各间隔将产生的辅助数据组存储在数据存储网络服务器上，由此更新的辅助数据组持续可用，基于移动站位于其中的局部区域选择存储的辅助数据组，并且使用选择的辅助数据组来计算指示移动站的位置的最终位置结果，以响应对位于一个局部区域中的移动站的位置的请求，其中所述请求由与所述移动站关联的辅助GPS客户发送，并且其中所述更新的辅助数据组，由所述辅助GPS客户用于确定对应最终的位置结果的GPS定位解决方案。 28. A method for providing network through location-based information, the method comprising: acquiring a plurality of GPS reference data sets at intervals each of the plurality of GPS reference data sets corresponding to a plurality of respective local areas, whereby each GPS reference data set is continually updated; based on the respective GPS data sets are generated corresponding to each local region of the plurality of auxiliary data sets in the interval, whereby each auxiliary groups continually updated; and generated in the auxiliary data interval group stored on the data storage network server, whereby updated continuously available auxiliary data sets, select a local area therein stores auxiliary data sets based on the mobile station, and using the selected set of auxiliary data indicating the position of the mobile station calculates a final position result, in response to a request for a partial region situated in the position of the mobile station, wherein the request is sent by the client assisted GPS associated with the mobile station, and wherein the updated set of auxiliary data, assisted by the GPS is used to determine the customer's position corresponds to the final results of GPS positioning solutions. 29.如权利要求观所述的方法，其中所述获取包括操作A-GPS服务器以基于GPS信号检索GPS数据，该GPS信号由位于各自的局部区域中的多个GPS参考接收器接收，并且所述产生包括操作A-GPS服务器以处理检索的GPS数据。 Concept 29. The method of claim, wherein said operation comprises obtaining A-GPS server to retrieve the GPS data based on GPS signals, the GPS signals received by a plurality of GPS reference receivers located in each local area, and the said GPS data includes an operation generating a-GPS server to process retrieved. 30.如权利要求观所述的方法，其中所述选择包括操作与移动站和数据存储网络服务器通信的基于位置的服务应用中心。 Concept 30. The method of claim, wherein the selected location based service application comprises an operating center in communication with the mobile station and the network server data storage. 31.如权利要求观所述的方法，其中计算最终的位置结果包括操作A-GPS服务器。 Concept 31. The method according to claim, wherein calculating the final position result comprises operating the A-GPS server. 32.如权利要求31所述的方法，包括操作A-GPS服务器，以为存储在数据存储网络服务器上的新位置数据持续扫描数据存储网络服务器，并且计算对应于找到的新位置数据的最终的位置结果。 The final position of 32. The method according to claim 31, comprising operating A-GPS server for the new location data stored in the data storage on the network server continuously scanned data network server, and calculates a position corresponding to the new data found in result. 33.如权利要求32所述的方法，包括将最终的位置结果转移到数据存储网络服务器， 用于在其上存储。 33. The method of claim 32, the final position result includes transferring data to a network storage server for storage thereon. 34.如权利要求33所述的方法，包括访问数据存储网络服务器以获得选择的最终位置结果，并且基于选择的最终位置结果产生基于位置的服务信息。 34. A method according to claim 33, comprising a network to access a data storage location server to obtain the final result of the selection, and a final position based on the selected result information of location-based services. 36. 一种用于经过网络提供基于位置的信息的系统，该系统包括：A-GPS服务器，用于产生对应于多个局部区域的GPS辅助数据组，并且计算位于一个局部区域中的移动站的最终的位置结果；数据存储网络服务器，其与A-GPS服务器通信，用于从A-GPS服务器接收辅助数据组并存储辅助数据组；以及LBS应用中心，其与数据存储网络服务器通信，用于将选择的辅助数据组转移到移动站，并且将位置结果从移动站转移到数据存储网络服务器，用于由A-GPS服务器在计算最终的位置结果中使用，其中所述移动站包括辅助GPS客户，并且其中转移到移动站的所述选择的辅助数据组，由所述辅助GPS客户用于确定对应位置结果的GPS定位解决方案。 36. A method for providing network through a location-based system information, the system comprising: A-GPS server, for generating a corresponding plurality of local regions set of GPS assistance data, and calculates a partial region situated in the mobile station final position result; a data storage network server in communication with the a-GPS server, for receiving the auxiliary data group and is stored auxiliary data sets from the a-GPS server; and an LBS application center, which stores data communications network server, with auxiliary data in the selected group is transferred to the mobile station, and the position result from the mobile station to a network server data storage, for use by the a-GPS server in computing the final position result in, wherein the mobile station comprises assisted GPS client, and wherein the mobile station is transferred to said selected set of auxiliary data, by the client assisted GPS for determining the position corresponding to the result of GPS positioning solutions. 37.如权利要求36所述的系统，其中A-GPS服务器与位于各自局部区域中的多个GPS 参考数据中心通信。 37. The system according to claim 36, wherein the A-GPS server and a plurality of GPS reference data centers located in each local area communication. 38.如权利要求36所述的系统，其中该数据存储网络服务器包括web服务器。 38. The system according to claim 36, wherein the data storage network server comprises a web server. 39.如权利要求36所述的系统，其中该数据存储网络服务器包括ftp服务器。 39. The system according to claim 36, wherein the data storage network server comprises an ftp server. 41.如权利要求36所述的系统，其中该LBS应用中心与网络应用服务器通信。 41. The system according to claim 36, wherein the LBS application center communicates with a network application server.